Julie Dawkins Family: Two for the Freezer and a Surprise in the Fridge! 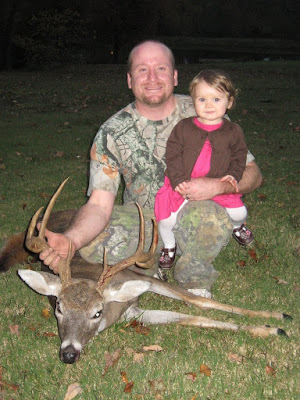 The Remington Man was back in the woods this weekend for opening day of black powder deer season. If you don't know much about hunting they start with the most primitive (and hardest) way to hunt first and that is with a bow and arrow, then a few weeks later they can use black powder guns for a few weeks (think civial war era...it's not just a bullet in the gun), then it's back to bow and arrow, and then at the end of the season you can use a rifle. 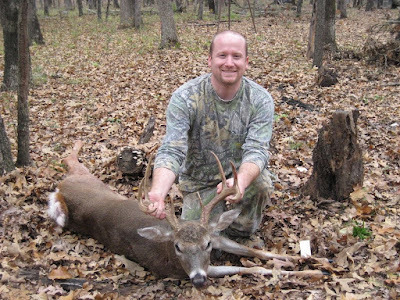 The Remington Man says his favorite is black powder; and it must be because he brought home two large deer this weekend. Our freezer is now completely full! Our little one will grow up know where the meat comes from and here it is in it's original package. I think it is important to teach her where her food comes from, to know that it takes a lot of hard work, and that she should be thankful for her food. This summer we took her to pick blackberries and blueberries, we have our own backyard garden, and now we have are own "organic" lean meat. Then there is this....anyone notice anything that doesn't belong in my kitchen fridge??? 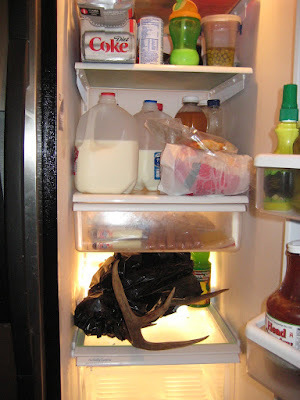 He told me he ran out of time to finish cleaning the antlers; so this was his solution. I am planning on making jerky this week. We have several quart size bags of meat cut for jerky; I would love to try out several different recipes. If anyone has a favorite jerky recipe please let me know! This is the one I am trying this week is from Mike Shelton courtesy of AllRecipes.com. 1. Slice meat in long strips, 1 inch wide and 1/8 in thick. 2. Place everything in a Ziploc bag refrigerated overnight. 3. Follow dehydrator instructions or preheat oven to 160 degrees. Place strips on rack so they don't touch. Place a pan below to catch the drips and leave for 6 to 8 hours to the desired consistency. It should be good! I'll update this post later and let you know! If anyone knows of anybody having a hard time providing food for their family this winter that could use some meat in the Tulsa area and they would eat venison let me know their situation at ThePersimmonPerch @ gmail.com and we will see what we can do. Thanks!